This journey to the North of Sri Lanka takes the train the town of Jaffna, heavily influenced by Tamil culture. As well as visiting Hindi temples, we spend some time camping on a remote beach, seeing the cultural heart of the country and snorkelling in clear waters off the country's East Coast. 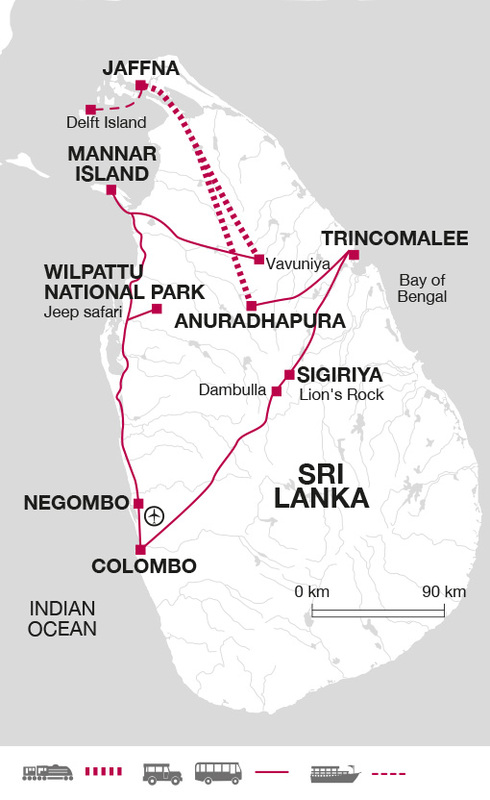 Negombo is the ideal starting point for our adventure. Just 15 minutes from the airport and well known for its fishing industry and golden sands, we can relax and enjoy a good meal or watch the sunset over the ocean on our first evening in Sri Lanka. We drive northwards along the coast and through the small towns of Chilaw and Putalam. We are heading for the uncrowded Willpattu National Park which boasts nearly 60 lakes and is renowned for leopard, elephant and sambar deer spottings. Our afternoon is spent exploring the park in four-wheel drive vehicles before retiring to our campsite for an al-fresco dinner and a night under canvas. Our tents have raised bed, mattress, pillows, and bed linen ensuring a comfortable night as we fall asleep to the sounds of the park. Today we head for the beautiful island of Mannar which is connected to the mainland by a causeway. On the way we visit the huge 2300-year-old site of Thanthirimale and its spectacular reclining Buddha statue, some 14 metres in length and painstakingly carved on the side of a huge rock. We'll also explore caves filled with pre-historic paintings and ancient inscriptions in the Brahmi and Linhala languages dating from the 3rd century BC, and we'll visit the famous Madhu Shrine. An important place of pilgrimage for Catholics, the shrine is home to a Madonna-and-child statue brought to the site in 1670 by Catholics fleeing persecution by Dutch Protestants. The diminutive figure has a reputation for miracles and is said to be particularly effective in protecting against snakebites. Once we cross the causeway on to Mannar Island we'll head along the western coastline of white sands, seeking out coastal ruins from the colonial period including the Doric Bungalow and Arippu Fort, reminders of Dutch, British and Portuguese interest in an area famous for its pearls. This morning we'll get the chance to interact with the island's fisherfolk going about their daily activities. We'll see family members contributing to the cleaning and mending of nets, watch the fishing boats bringing in their catch, and discover the abundant bird life around the area. In the afternoon we will visit the old Talaimannar Pier and the 12 metre long graves which legend says belong to Adam and Eve. Later we'll take in Mannar Fort, St Lucia's Church, and Thiruketheeswaram Kovil temple, before taking a walk along Urumalai beach where vast sand banks for the tip of the island, separating the 'male' and 'female' seas, before enjoying a barbecue dinner on the beach. After breakfast we drive to Vavuniya to catch the train to Jaffna. The train journey provides a great opportunity to mix with the local as we pass through beautiful countryside and stop of at small village stations. We' arrive in to Jaffna via the Elephant pass, a small strip of land that connects the peninsula to the rest of the island and is known as the 'gateway to Jaffna'. We'll arrive in to the bustling northern city around mid-afternoon and take a short walk to our hotel. An early start this morning as we take a short boat ride to the remote and wind-swept island of Delft. Although inhabited, it has a deserted feel to it and once we get away from the port area we are as likely to see the wild Delft ponies as we are the island's people. The shallow waters surrounding the island are famously turquoise and the sands are almost white. There is a small Dutch Fort made of coral and a 'growing' rock to explore. In the afternoon we move on to Nagadeepa Island, an important place of pilgrimage for both Hindus and Buddhists. The latter revere the Rajayathana stupa built at the place where the Buddha intervened between two warring kings during his second visit to Sri Lanka. The former visit the Naga Pooshani Amman Kovil Temple, dedicated to the goddess Meenakshi, a consort of Shiva and said to help women conceive. Our exploration of Jaffna begins with a visit to Keerimalai natural springs where legend has it the mythical sage 'Nagula Muni', born with the face of a mongoose, meditated and bathed in the springs to turn his face in to a human one. The waters have a high mineral content and locals believe they have many health benefits. In Jaffna itself we will visit the ancient Buddhist burial site of Kantharodai and Jaffna Fort. Built in 1618 when the Portuguese took the city, the fort's impressive walls are largely intact and still form an impregnable barrier to anyone trying to enter the harbour. We'll also visit Nallur temple, the largest and most important Hindu temple in the area, venturing inside to learn about Hindu worshiping practices. Finally we'll wander around the colourful Jaffna Market where local food and handicrafts are available to be bartered for and bought. 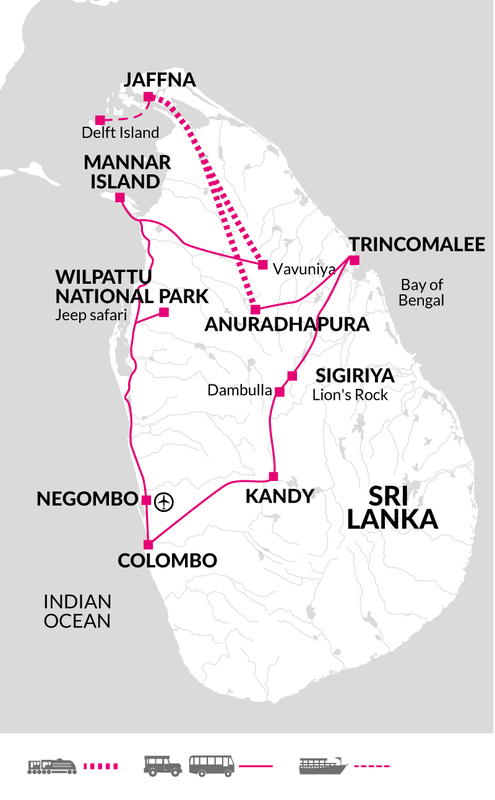 We'll depart feeling we have a real insight into the north of Sri Lanka and its Tamil culture. Leaving Jaffna on the early morning train we alight at Anuradhapura, an ancient capital famous for its well-preserved ruins and a UNESCO World Heritage Site. Founded around 500 BC, it is one of the oldest continually inhabited cities in the world. Anuradhapura's golden age began in around 260 BC when the king converted to Buddhism and the city began a rapid expansion. Hospitals, hostels and artificial reservoirs were built and the city soon spread to cover several miles. We'll get a sense of its former grandeur as we discover the 2,200 year-old sacred Bo-Tree; the Brazen Palace, once a nine storey residence for monks; and the 4th century Smadhi Buddha masterpiece and the Ruvanvalisaya Dagoba - a 90 metre-high dome-shaped shrine towering over the surrounding countryside. This morning we travel to the mountain peak of Mihintale, the site of the momentous meeting between the monk Mahinda and King Devanampiyatissa, which resulted in the introduction of Buddhism to the country. Reaching the summit involves climbing a flight of 1840 shallow stone steps, but the stunning views from the top are well worth the effort. In the afternoon we drive to Trincomalee. Set in a beautiful location this east coast town straddles a narrow peninsular between the Indian Ocean and one of the largest natural harbours in the world. We'll explore the town on foot and enjoy its charming mix of sleepy backstreets, colonial villas, mosques, churches and temples. Just off the coast of Trincomalee, a short boat ride will take us to Pigeon Island, famed for its powdery white sands and coral gardens. The reef here is very shallow, making snorkelling very rewarding with dozens of corals, a multitude of reef fish, black tip reef sharks and turtles all likely sightings. After exploring the underwater world, we discover what Trincomalee has to offer on land, including the old town, Kanniya Hot wells, Marble Beach and Konewaram Temple. The area is famously one of the few places in the world where Blue whales and Sperm whales can sometimes be spotted from land and the Konewaram Temple is a particularly good vantage point; binoculars are recommended. Whale watching cruises may also be possible on a Navy boat however there is no regular schedule. Your Explore Leader will offer you this option if it is available during your visit. The World Heritage Site of Dambulla is our first stop today. Thought to have been a place of worship since 1st century BC, when King Valagamba took refuge here, the interior of the caves are carved into magnificent rock temples. We will visit five separate caves, which contain a large number of Buddha images and sculptures of Hindu Gods. In the late afternoon we visit Minneriya or Kaudulla National Park depending on which one has had the best sightings according to the local rangers. Next door to each other, both parks are renowned for their gatherings of elephants in the dry season and should offer a good opportunity to view wild elephants in large numbers. The parks are also home to a large array of birdlife, including painted storks. This morning we have two options to choose from. We can climb the famous Lion's Rock or nearby Pidurangala. Lion's Rock is a 'sky fortress' dating to the 5th century and one of Sri Lanka's major attractions; our early start ensures we beat the crowds and make the climb before it gets too hot. Built in just seven years as a fortified palace to protect the reign of merciless King Kassapa, it is seen as one of the world's best-preserved examples of ancient urban planning. A switchback series of steps and steel stairways ascend to the top. Halfway up, tucked beneath a sheltering overhang of rock, are the famous frescoes - the Sigiriya Damsels, their colours still vibrant. Once at the 200 metre summit, magnificent views can be enjoyed of the surrounding jungle and countryside. The lesser visited Pidurangala involves a short climb up steep steps to the 10th Century Royal Cave Temple and large reclining Buddha. From here the summit is reached via a rough path and the reward is a stunning vista of the surrounding countryside and a perfect view of Lion's Rock. In the afternoon we explore the ancient city of Polonnaruwa. The city reached its height of glory in the 12th century and still maintains many of its spectacular buildings and monuments. Arguably the most impressive is the Quadrangle, a superbly decorated circular shrine which is one of the most ornate buildings and the former home of the tooth of Buddha relic. Another famous feature of this deserted city is the group of carved images of the Buddha, known as Galvihara. These four colossal figures are all hewn out of solid granite and the Reclining Buddha alone a massive 14 metres long. We head to Colombo for an afternoon exploring Sri Lanka's capital city. We'll visit Wolfendhal Church, the oldest in Colombo with a name that reminds us of a time when wild beasts roamed the area, and Captain's Garden Hindu Temple which is famous for its constant live music and the beautiful painted images and statues on the ceiling. We'll wander round the 'fort' area, now the business district, whose buildings are like a slice through Colombo's colonial history and visit the Pettah neighborhood, famous for its bustling open air bazaars and markets. Finally, as the sun sets, we'll enjoy afternoon tea at the famous Galleface hotel which overlooks Galleface Green, a popular haunt with locals out for an evening stroll. Our trip ends in Colombo after breakfast. You will need loose fitting, comfortable clothes for hot, humid conditions. Sunhat, sunglasses, long trousers and long sleeved shirt are essential for protection from the sun. Lightweight rainwear is also recommended. When visiting religious sites you will need to dress respectfully by covering you knees and shoulders plus taking off your shoes and hats. You may like to wear socks for temple visits as the ground can get very hot and burn the soles of your feet. You will need to bring long trousers, or buy a sarong locally. A refillable water bottle is recommended. Binoculars are a good idea for whale watching. Northern Sri Lanka has only just opened up after a 30 year civil war. This means that the area has a very raw and unpolished feel to it, and is a different proposition to the much visited south. It also means that travelling there offers a very interesting and authentic experience. Unused to tourists, you'll find the locals friendly and inquisitive, but you'll also find that service can be relaxed and that time can be a somewhat vague concept. There is still a military presence with the occasional checkpoint and some services that you'd expect to be in private hands are run by the army or navy (for example the whale watching boat in Trincomalee). To help our trips operate as smoothly as possible, we use our experienced local partner and Explore leaders from the south of Sri Lanka, assisted by a local agent in the north and local guides where necessary. While an open mind is an advantage, there is no doubt that visiting now is the ideal time as you'll get to see the real Northern Sri Lanka before it starts to change and loses something of its unspoilt charm.